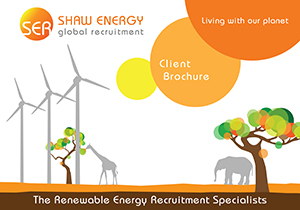 Shaw Energy Recruitment is renowned for its professional and personal quality of service. We have specialist knowledge within all renewable energy job recruitment sectors and our well-established ability to seek and attract the best possible candidates of the highest calibre worldwide. We work passionately to place a candidate with not only the right specialist skills & experience but also the attitude and cultural attributes to fill your renewable energy jobs specific requirements. Whether you are searching for renewable energy permanent hire, an interim specialist contractor or an executive leader, we are here to listen carefully to all of your specific requirements. We take a personal and transparent approach to every search, and we are passionate about the success of your business. SER consultants are all long term experts in the renewable energy jobs & sustainability sectors, here to understand and succeed for you. Our global close knit team of specialist renewable energy consultants will comprehensively research every avenue using our vast senior contacts database and ever expanding social media network and resources to source perfect candidates for your renewable energy vacancies. We always follow each and every lead through to full completion and are committed to go the extra mile for your success.